Holi is one of the most important festivals for Hindus. Holi, the festival of colors adds more color to the life of the people of Rajasthan. It is celebrated with great enthusiasm and joy. On this colorful festival people mingle not only with their friends and relatives but also with those who they do not like. They forget all the past hurts and grudges and apply the color of friendship on each other. The festival spreads the message of brotherhood. How noble! Holi falls on Phalgun Purnima or Poranmashi (full moon) in the month of March or April. Holi is a two day festival. On the night of the first day (a night before the full moon) people including children, youth and even the old ones come together gathering dried leaves and branches of trees to lit a bonfire. The significance of this ritual is the burning of demon Holika, Hiranyakashipu's sister. In simple terms it is the burning of 'evil' in our lives. 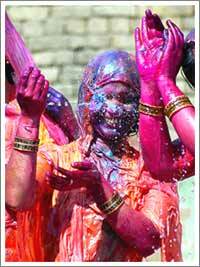 On the next morning, people throw gulal (colored powder) and water on each other. The merriment becomes more joyful with dance and music. People play Holi while swaying on the beat of drums. Most of the people of Rajasthan make colors at home by mixing Neem, Kumkum, Haldi and Bilva which are believed to have medicinal properties and hence do not cause any harm. A special drink is also a part of the celebration—Bhang (Cannabis sativa). On Holi, the women make different kinds of sweets and Namkeen at home and later in the eve invite their friends and relatives for a fabulous feast. When men hurl color and water on women, the latter one hit the former with sticks or long pieces of cloth folded in such a way that they take the form of a stick. Children are ever ready to throw colored water filled balloons on the passerby. They also drench people with their pichkari. Come and savor an unforgettable experience enveloped in colors!